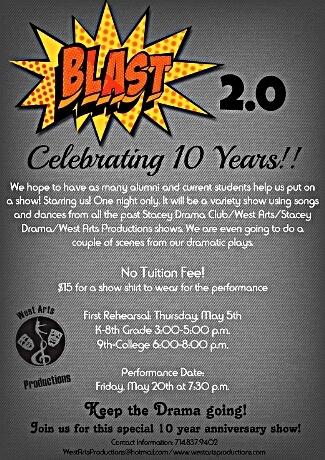 To celebrate their 10 year anniversary, West Arts Productions is putting on the musical, Blast 2.0! Blast 2.0 is a combination of all the amazing productions our program produced in the past years. Even the people who haven’t been in it for years can do this musical mash-up! “I’m so excited to do Blast 2.0; we’re combining all the shows we’ve done into one. It’s going to be a really new and fun experience,” says seventh-grader Alex Terrible. If you have been a part of at least one of our shows, including ensemble, you are qualified to be a part of this exciting performance. The required age limit are students ranging from kindergarten all the way up to college. And no registration fee is necessary! For students who are in kindergarten up to eighth grade, the first rehearsal is on May 5th, from 3:00 p.m. to 5:00 p.m. in the multipurpose room. For students in ninth grade up to college, the first upcoming rehearsal begins on May 5th from 6:00 p.m. to 8:00 p.m. in the multipurpose room. Show shirts are $15 each and are a requirement to wear for the show on May 20th at 7:30p.m. West Arts Productions hopes you will join this fun and exciting show!